Getting out of bed in the morning can be so much easier when you wake up in a beautiful room. So why not make your bedroom beautiful? Your bed is the central focus of your bedroom and so finding the right bed is the first step. It should look inviting, be comfortable, and reflect your unique style. Luckily, there are many shapes, sizes and styles of classic and modern bed frames in Calgary to choose from. Which Bed Suits Your Style? Are you a romantic, a minimalist or a traditionalist? Classic bed styles include sleigh beds, four-poster beds, low post beds, canopy beds and upholstered beds. Four-poster and canopy beds allow you to integrate fabric into the design, and you can choose from traditional fabrics such as velvet or brocade, or more contemporary fabrics such as light-coloured silks, sheer muslin or cotton fabrics. The platform bed is a popular contemporary choice due to the simplicity of the design. The bedframe is lower than traditional styles, and many of the clean designs have no headboard or footboard for a modern and sophisticated effect. Upholstered beds can bridge modern and classic bed styles depending on the fabric used. 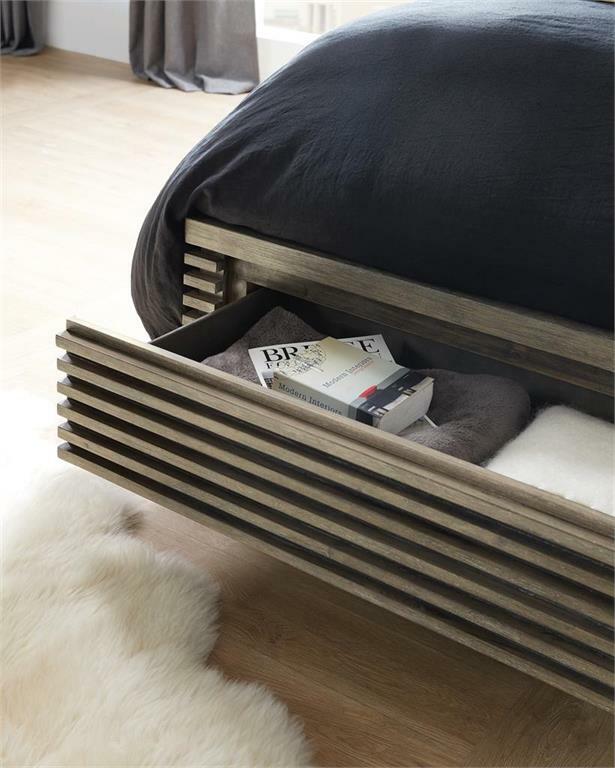 Take a look at the Maxime king bed frame in our Calgary showroom. This platform bed frame is a modern design that looks and feels romantic, classic, and ever so inviting. Wood, metal, fabric, leather are all great options to incorporate into a bed frame. There are so many choices of bed frames, and today’s designs incorporate a wonderful selection of materials that complement each other. The profile poster king bed is a perfect example of how a traditional style can be transformed into a modern bed using contemporary materials. 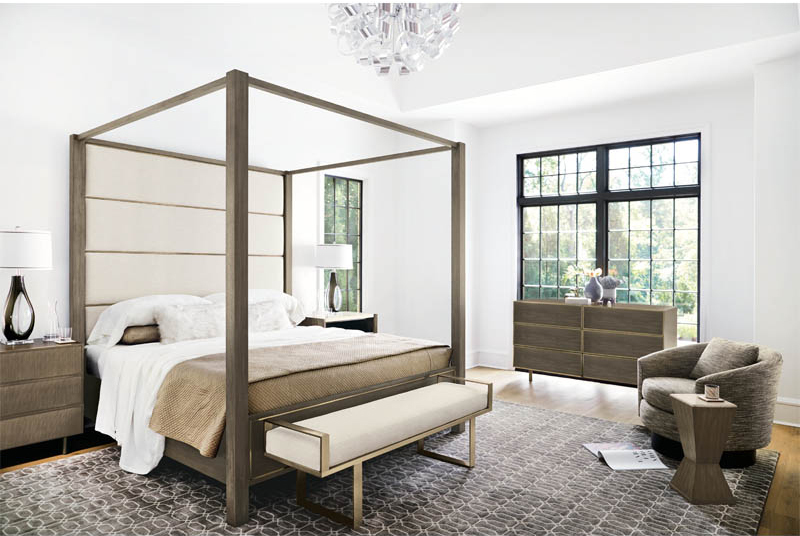 The stainless steel framed headboard in a tapestry gold finish with upholstered inset panels complements the wood side rails, canopy and posts. Now that you know your style, what about the size? Is the bed for you, you and your partner, or your guest bedroom? Do you need a little extra space for the dog? Do you need storage? Do your kids crawl into your bed at night? Before you decide on the size of bed frame, measure the room. The standard design rule is to allow at least 24 inches between the bed and the wall, and allow 36 inches between the end of the bed and the bedroom or bathroom door. A queen-size bed is roughly 5 sq. ft. by 7 sq. ft , therefore, the room should measure at least 10 by 10 sq. ft. A king-sized bed measures around 6 sq. ft. 4 inches by 6 sq. ft. 8 inches and needs a room that is 12 by 12 sq. ft to ensure adequate space. If you are investing in a new bed, a king size frame will give you the extra space and extra comfort you need. If you need a little extra space in the bedroom, a queen-sized bed frame is a popular choice for most couples and gives singles a luxurious amount of space. A common question our customers ask is whether they should buy a mattress or get a box spring and mattress. This depends on your bed frame; some traditional bed frames with slat systems don’t need a box spring, while others might need a box spring foundation for the mattress. Platform beds don’t necessarily need a box spring, however, it’s something to consider because it can help prolong the life of your mattress and raise the height of the bed. Start your day with a smile in your perfectly styled bedroom. Come down to Bondars in Calgary to browse our selection of bed frames in a variety of styles. A bed frame is more than a home for your mattress - it’s the focal point of your bedroom and the piece that ties the room together. Check out our How To Shop Buyer’s Guide to help you choose the perfect bed for your bedroom.